Meet Your Neighbor Cindy Anders, the daughter of Duane and Pat Deitrich. Cindy has lived in La Harpe all her life. Shehas been married to her husband, Tracey Anders, for 23 years and they have three children, Amber (26) wholives in Springfield and is in Retail Management; Jaden (20) lives in Quincy and is attending Blessing Rieman College of Nursing and Trayton (4) just started preschool this year. Cindy has worked for Jay Jones at Jones Insurance in La Harpe for 23 years and is aCertified Insurance Service Representative. She holds an insurance license in Property and Casualty and will obtain her Life and Healthlicense this November. 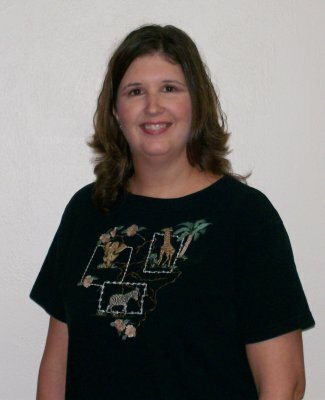 Cindy is a member of the La Harpe Union Church where she directs the bell choir. She plays the piano and loves music, sells Avon, enjoys scrapbooking and their annual family vacations. This year they went to Lake Michigan and had a wonderful time.They try to go somewhere new each year, except for Florida. "We have been there several times. We all really like it."